Lake Michigan is the only one of the Great Lakes that is wholly within the United States, although the state of Michigan has coastlines on four of the Great Lakes, plus Lake St Clair (which connects Lakes Huron and Erie, but is not officially a Great Lake) and has more lighthouses than any other state. A dream driving vacation for me would be to visit all the lighthouses. As you can see from this postcard, there are a lot of them! Around 150 in Michigan, and over 50 on Lake Michigan alone between Michigan and Wisconsin. Marblehead (Sandusky Bay), Lake Erie; White Shoal Light, Lake Michigan, Split Rock, Lake Superior, Holland Harbor, Lake Michigan; Charlotte Genesee, Lake Ontario; Marquette Harbor, Lake Superior; Cheboygan, Lake Huron. 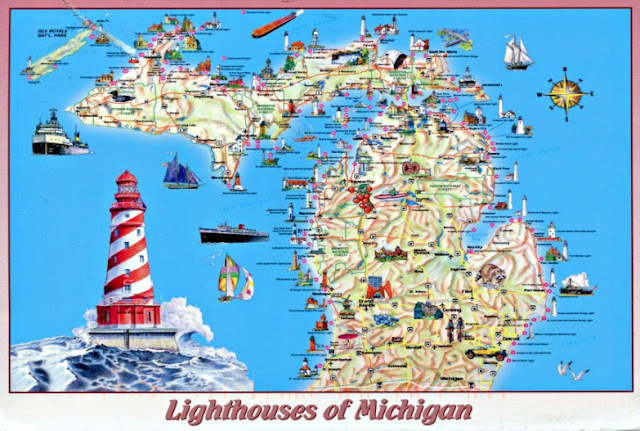 A few more lighthouses from each of the Great Lakes and the states of Ohio, Michigan, Minnesota, New York. The only one of these I've seen is the Charlotte-Genessee lighthouse (the octagonal stone one under the U) in Rochester - the oldest (built 1822) surviving, and active, lighthouse on Lake Ontario. Beautiful map card, and indeed amazing to see how many lighthouses there are. I wish the map was a bit easier to read, but then it would need to be a bit bigger all around, I think! ...something to put on my to do list. a summer road trip, maybe? I love the firs postcard. The second one (I've got some of those) looks a bit chaotic. I've made some trips "from lighthouse to lighthouse". But all lighthouses on Lake Michigan... We would need a bit of time! Luckily, I live nearby so could do it in sections over a few trips! I think you should set that goal!! You'd see some amazing country as you traveled as well as these wonderful lighthouses. (As I was typing this I saw your reply to the comment above and went back and read all the comments... I see you've already thought about that. Wonderful postcard. We really really really need to visit Michigan. 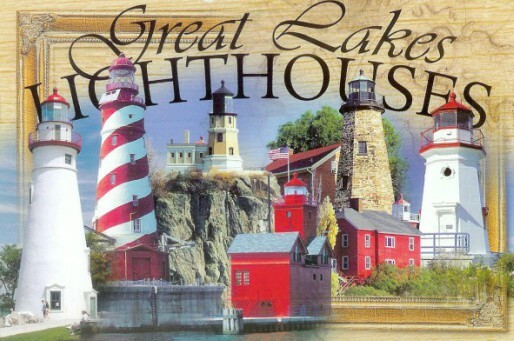 It's impressive how many lighthouses are there in this postcard!